BE777. 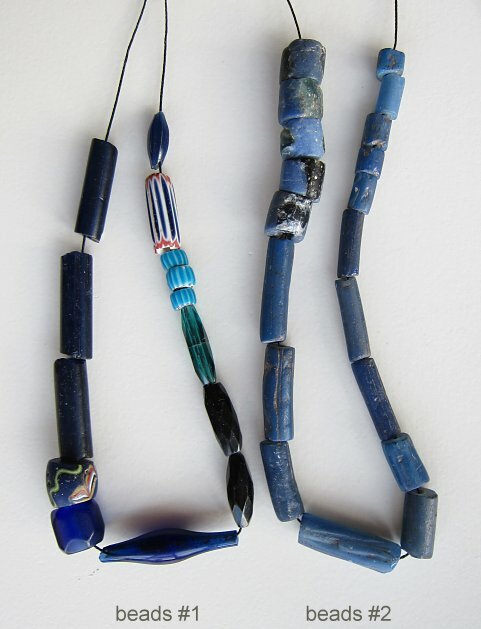 These blue beads were made from the grindings of broken trade beads, but re-made in Africa. 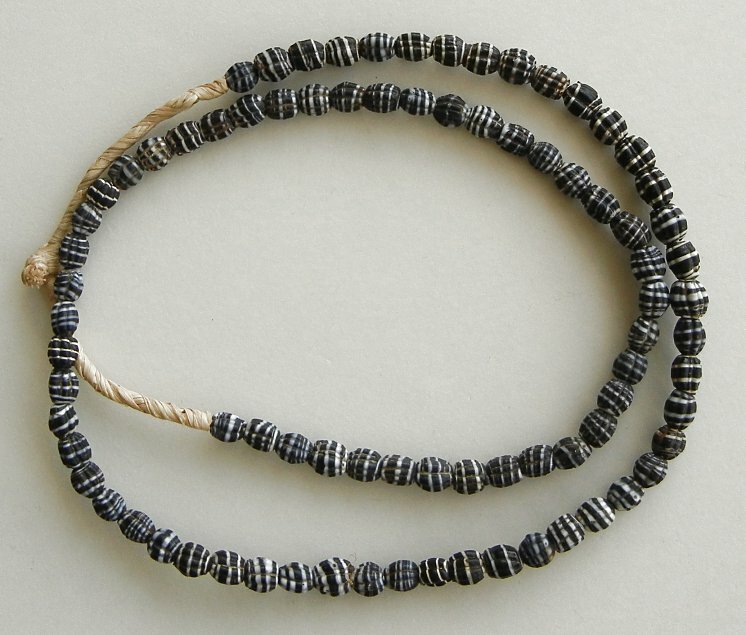 They are known as "Aggrey beads". 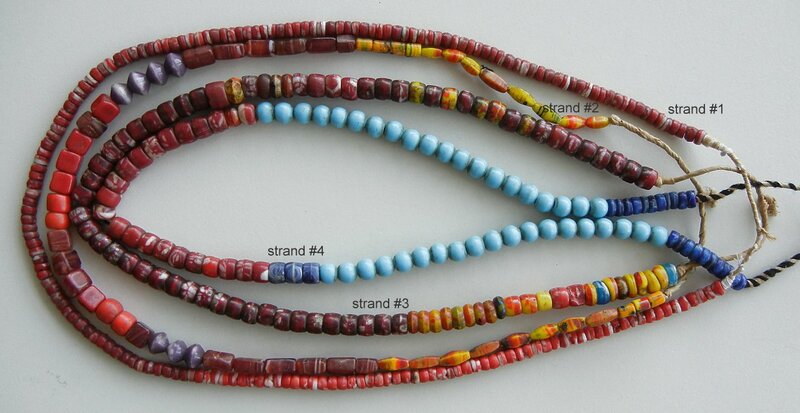 Strand #1 is 26 inches long - $75.US. 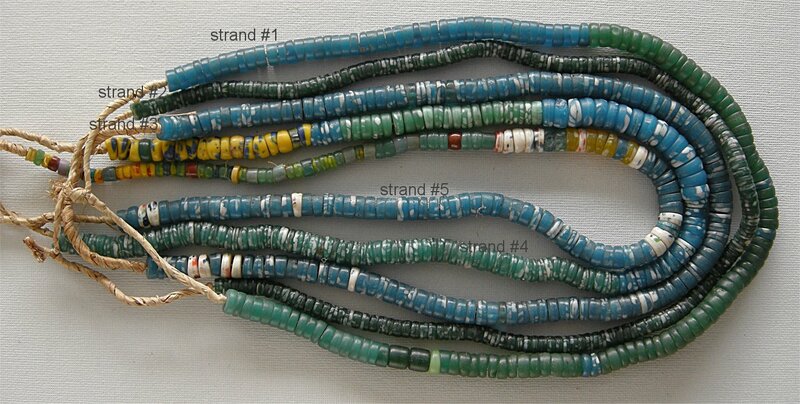 Strand #2 is 26 inches long - $75.US. BE783. 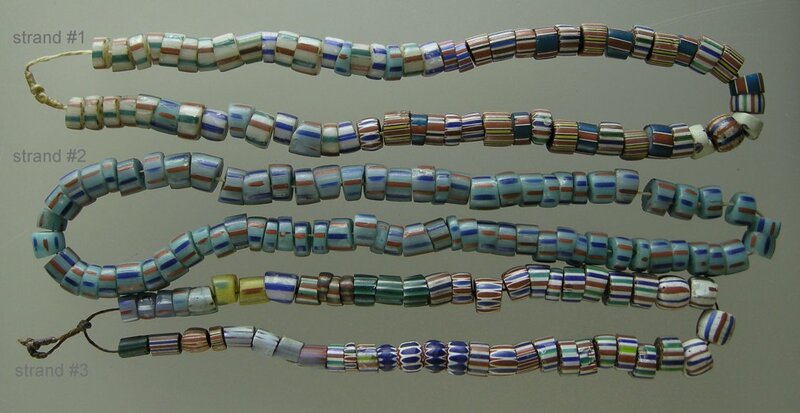 These vintage facet Czech beads are 7/16 inch in diameter and 15 inches in length. $45.US. BE997. 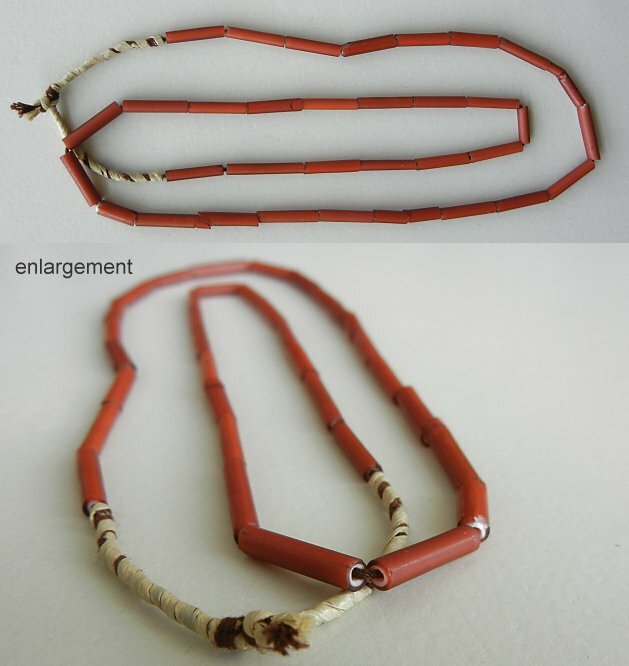 There are 24 inches of the red spotted beads. $155.US. BE1010. 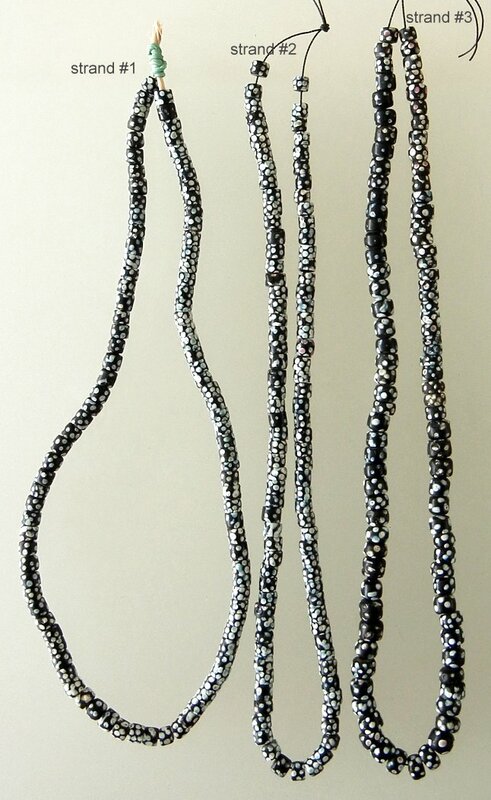 French cross beads - $45.US/each strand. BE1011. 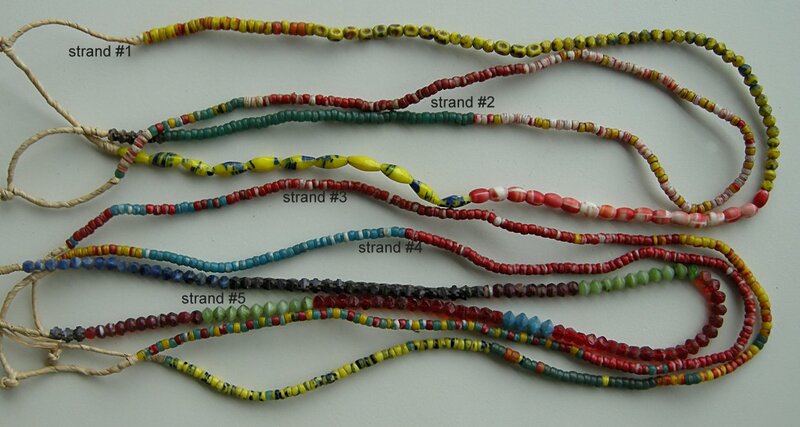 French cross beads - $40.US/each strand. BE1015. 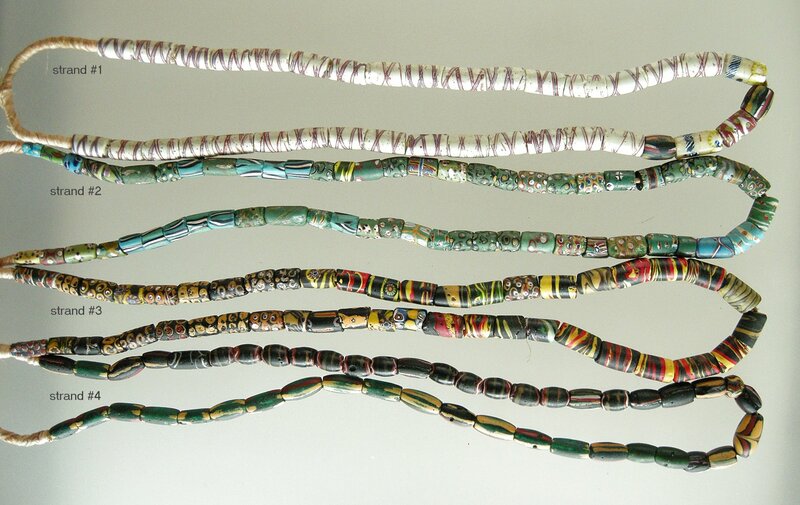 Antique glass snake beads - $32.US/each strand. BE1023. 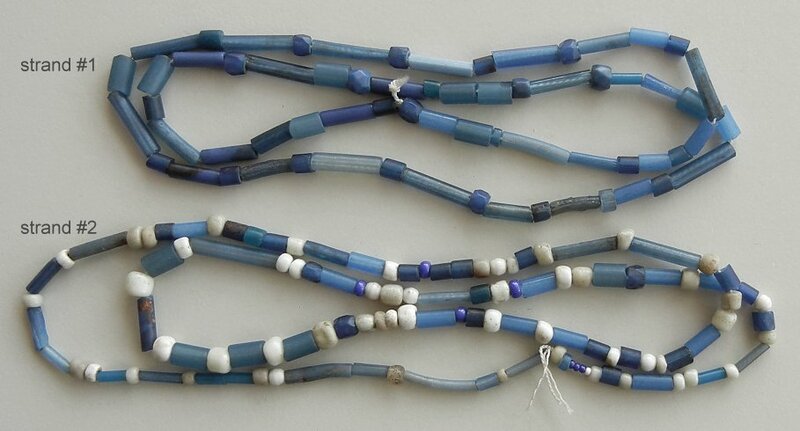 This strand of antique glass trade beads made in Venice is just over 32 inches long. 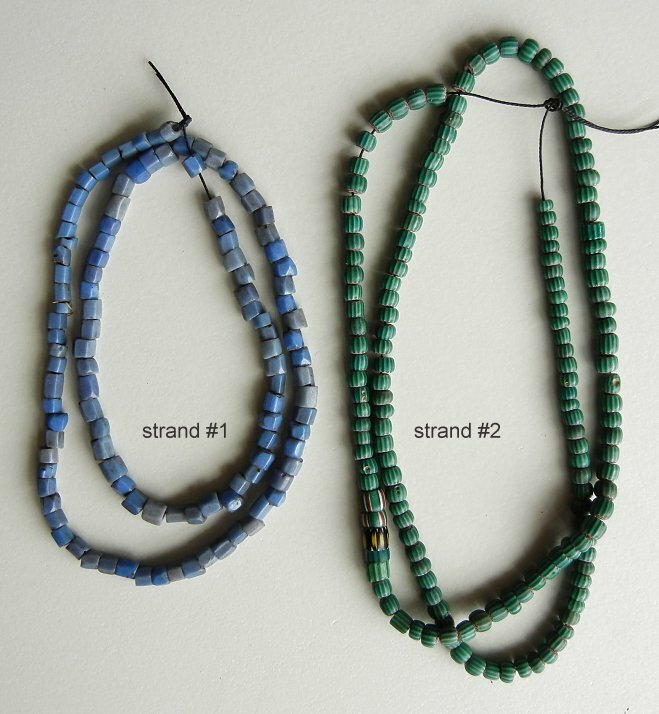 The beads are smaller and more delicate than the strand above. $250.US. BE1024. 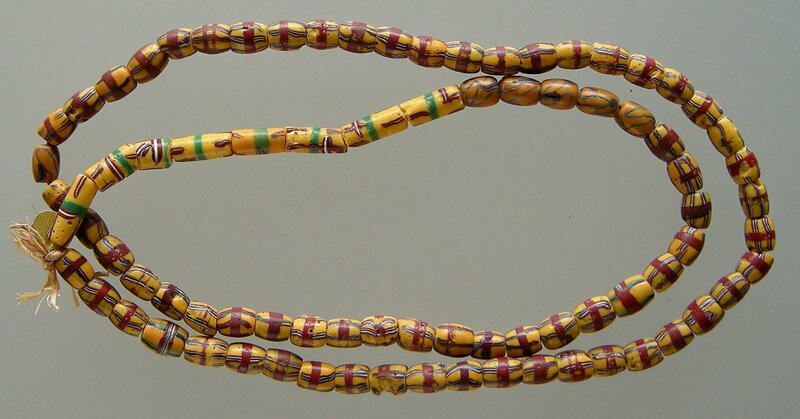 There are two very different strands of antique vaseline beads illustrated here. 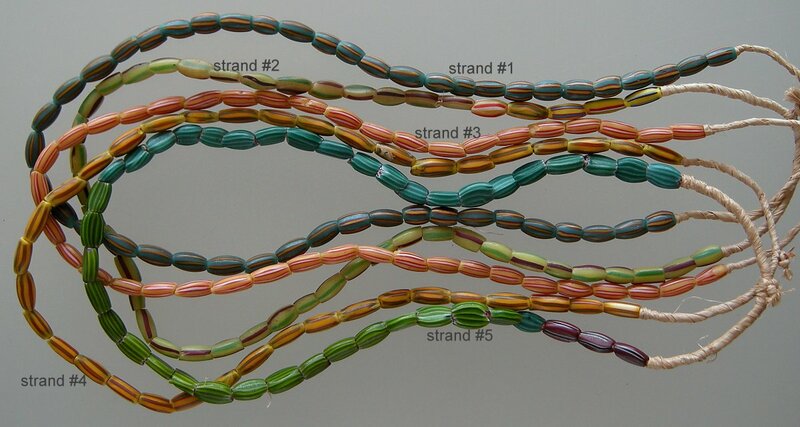 Strand #1 is 28 inches long combining both green and red. $75.US. 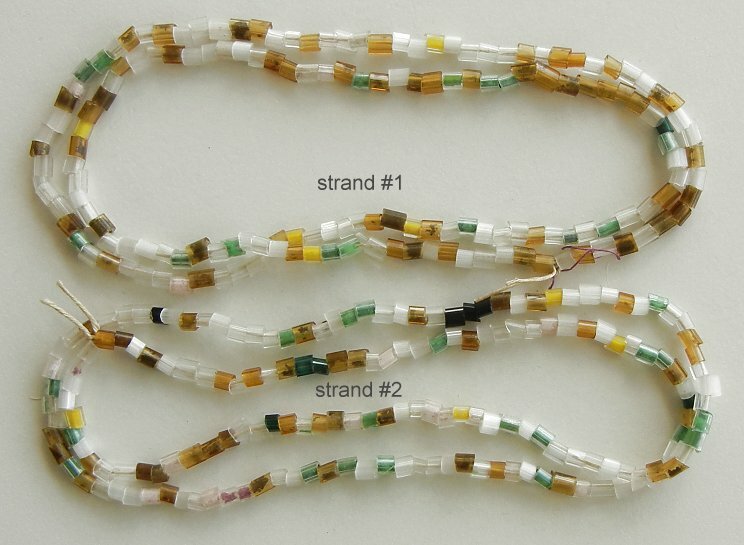 Strand #2 is 26 inches long with a wider variety of beads. $110.US. BE1026. 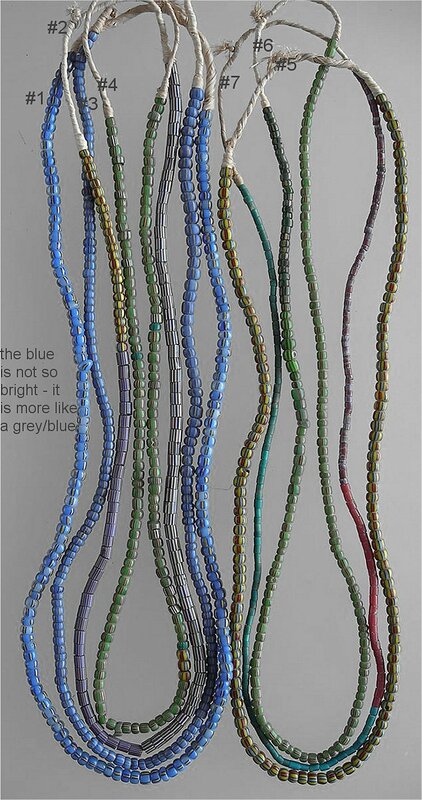 33 inches of beads with the fattest one in the front being 3/4 inch in diameter. BE1030. 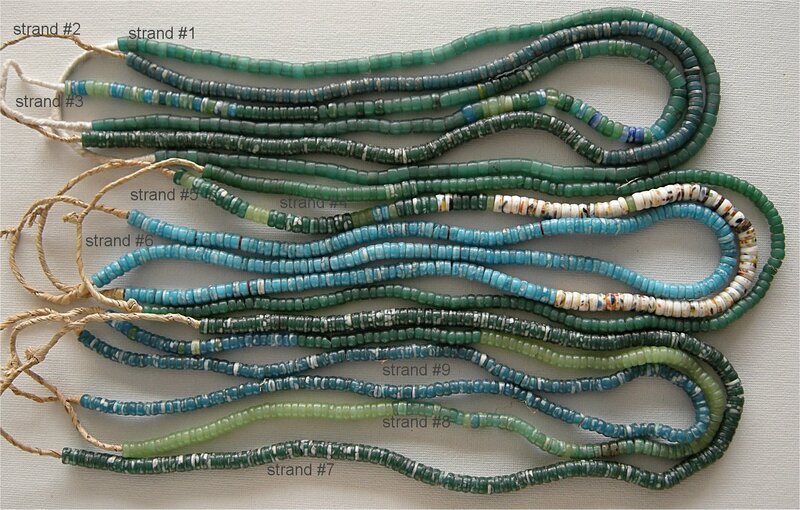 average 22 inches of beads on the strand. $28.US. BE1055. 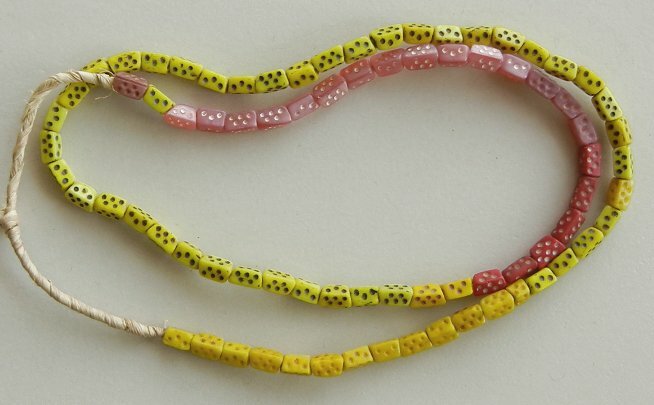 Dice beads - $22.US. BE1071. 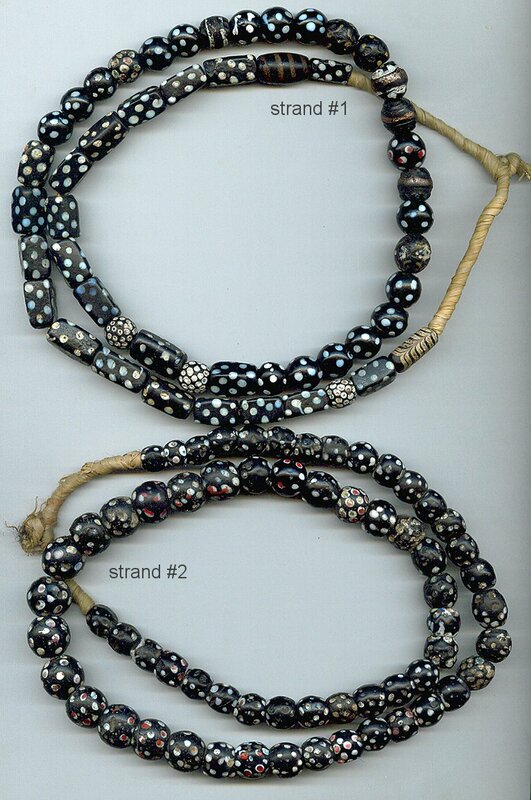 These beads are $75.US/each strand. Strand #1 is 30 inches long. 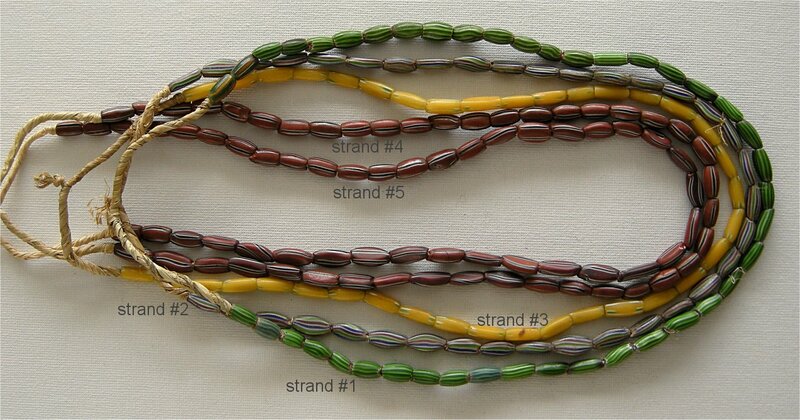 Strand #2 is 34 inches long. BE2018. 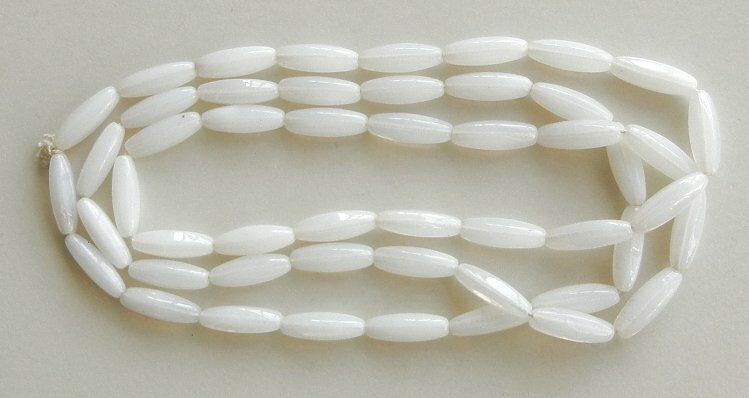 This strand is 20 inches of skinny glass brick coloured white hearts. $65.US. BE2033. 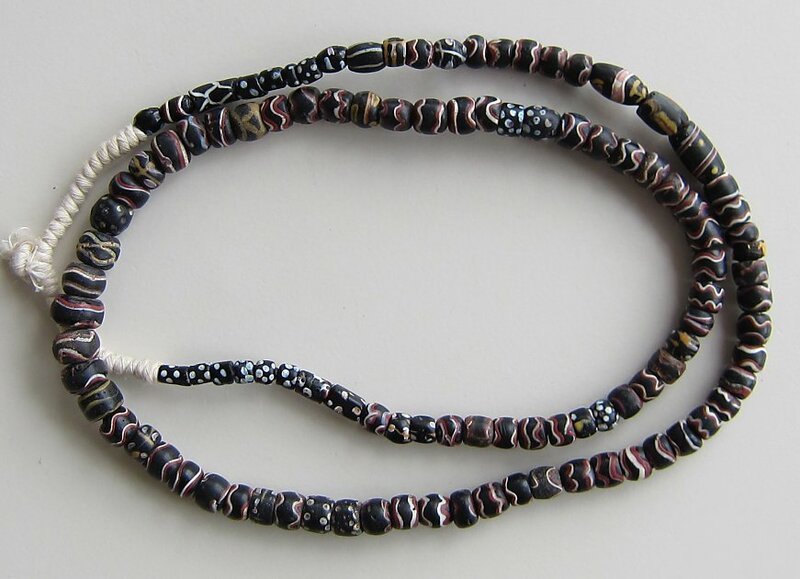 The antique beads in strand #1 are Venetian made, lampwork criss-cross trailed with pink stripes and dotted with dark colours. 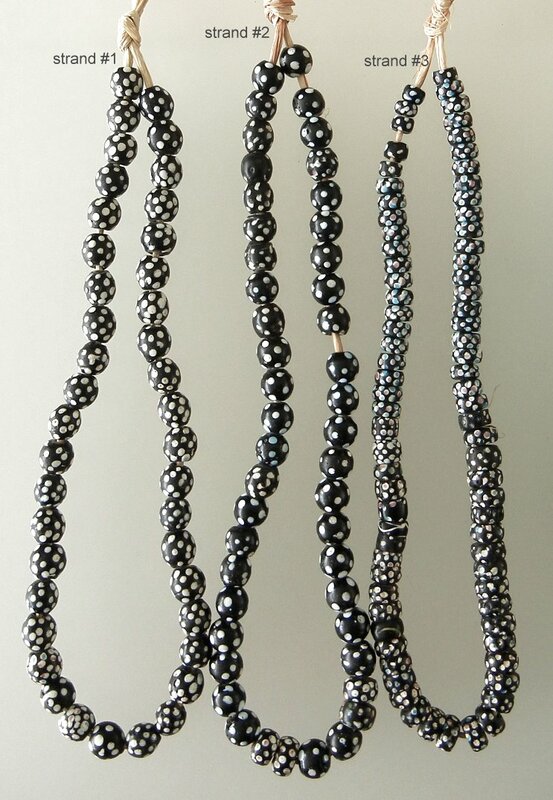 There are a little more than 22 inches of beads on the strand averaging 7-9mm in diameter. $135.US. 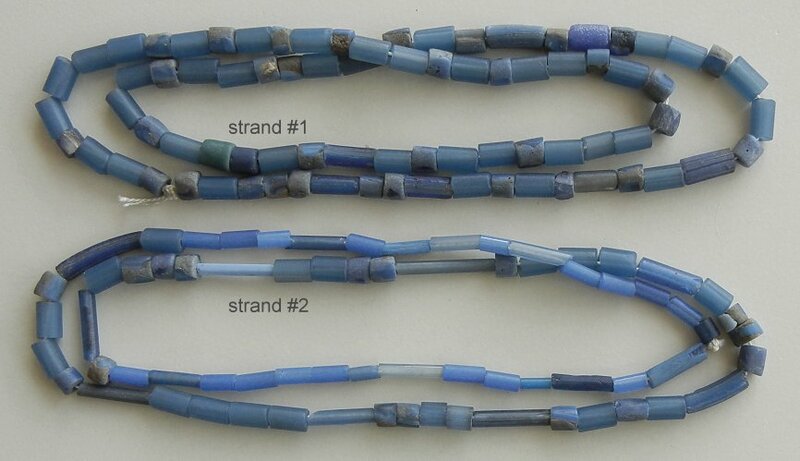 Strand #2 is made of opaque Russian blue beads. 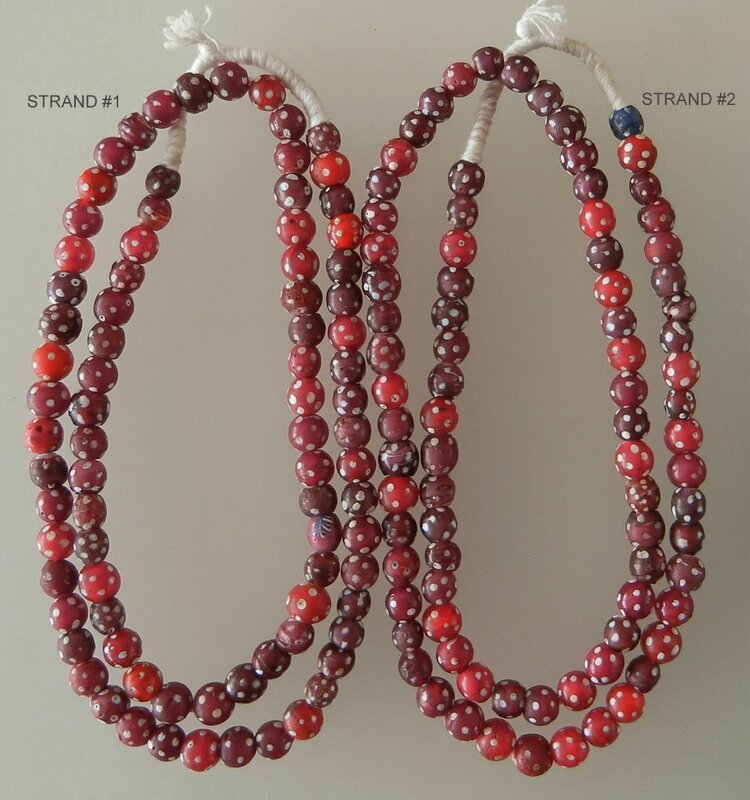 There are 23 inches of beads on the strand. $75.US. BE2034. 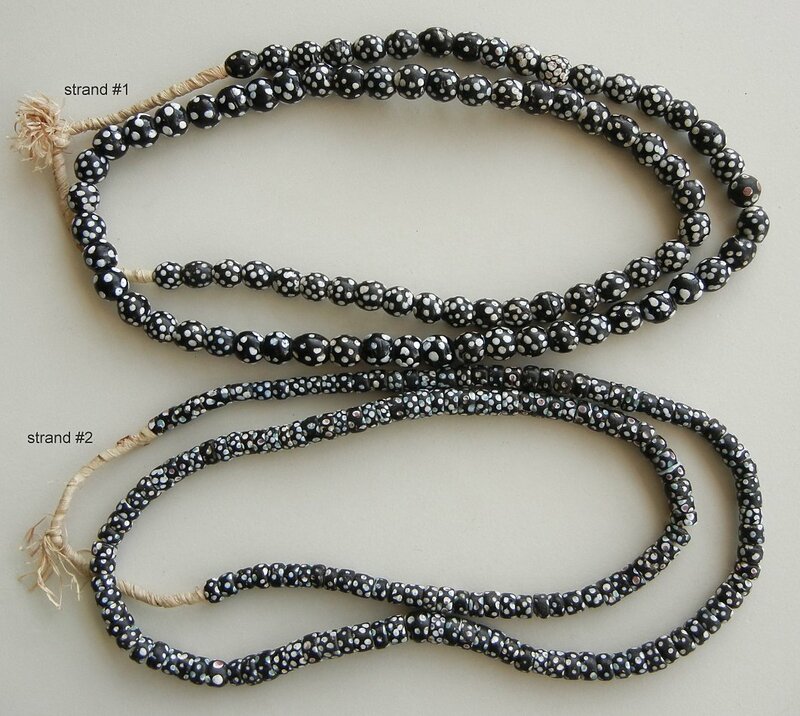 There are 44 inches of Czech beads on this strand. They average 7/8 inches long. 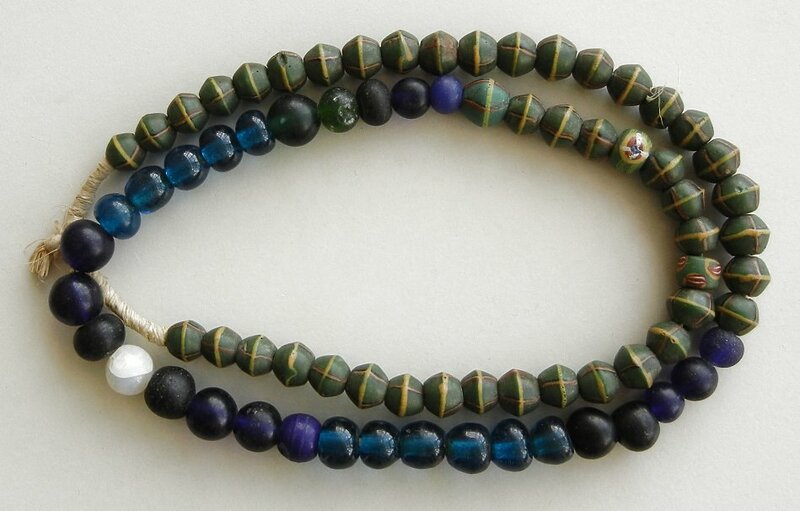 The beads actually reflect colours in the way that opal does - they are quite wonderful. $65.US. BE599. 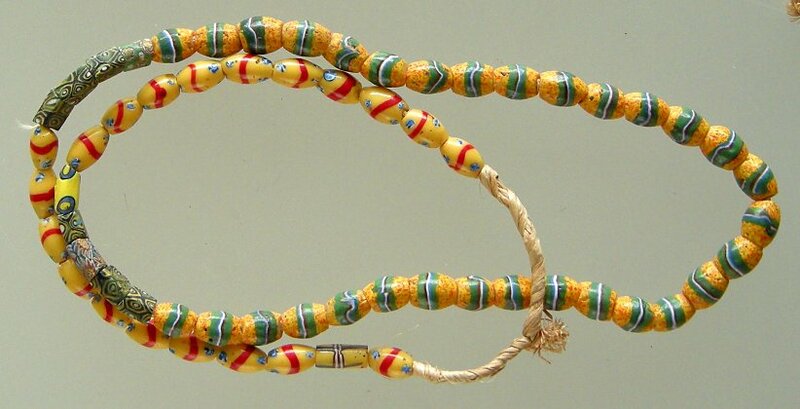 This is a 25 inch long strand of Venetian trade beads in warm colours - the sun shines here. 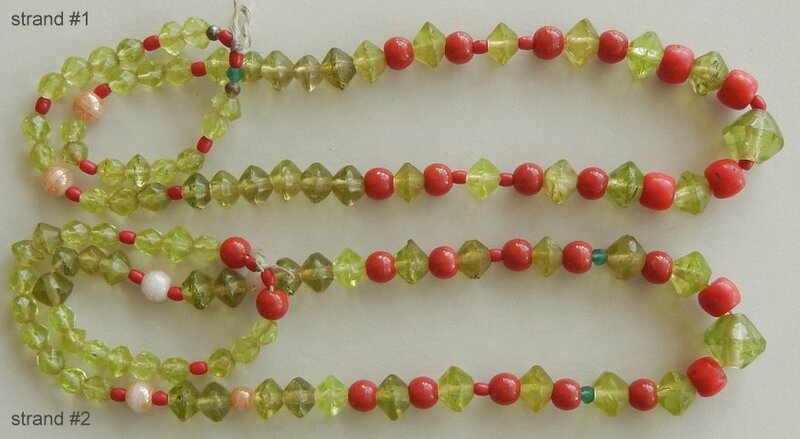 In between the brighter beads there are some wonderful little four sided beads of dark green and yellow. They are intriguing. $95.US. BE600. 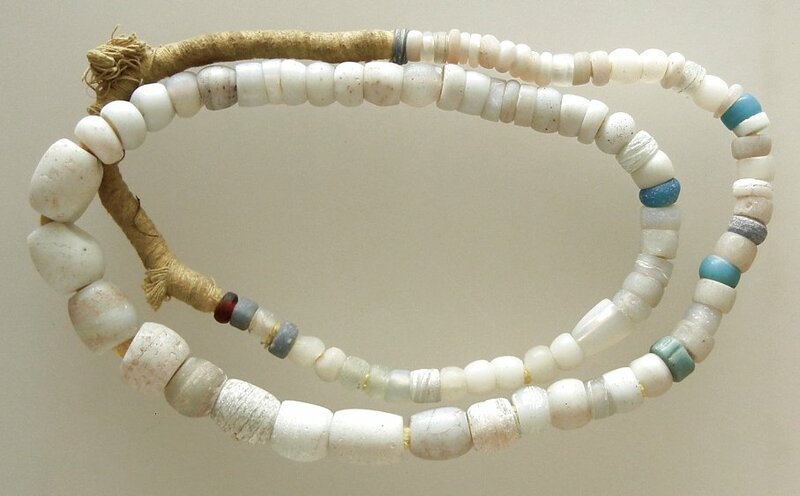 This is a long 33 inch long strand of Venetian beads. 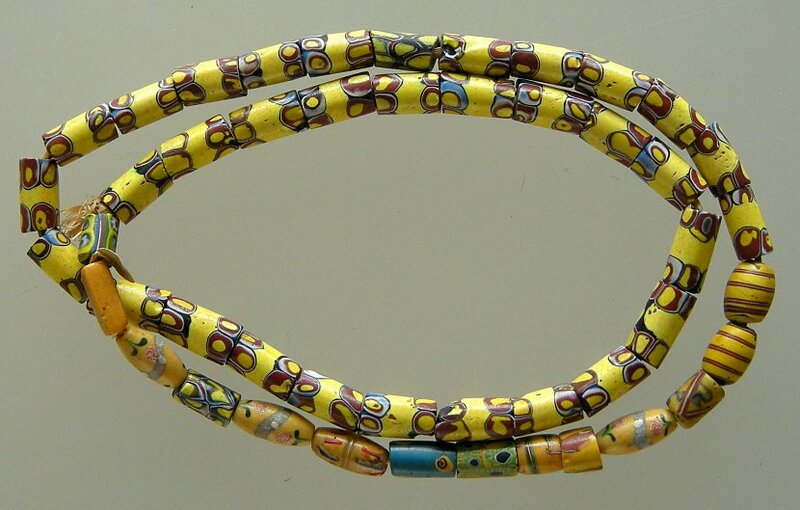 There are three wonderful oval beads (7/8 inch long) with roses on them. 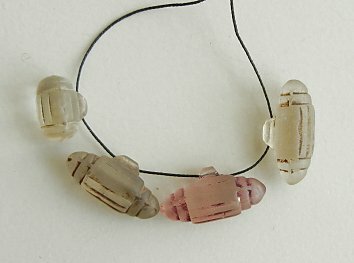 One bead has a small chip on it but the other two are in excellent condition. 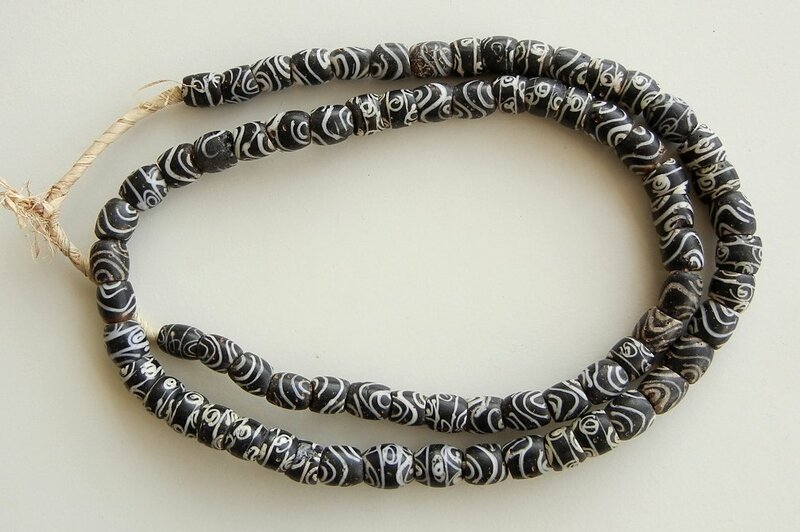 There are some other interesting single beads thrown in the strand as well. $195.US. BE603. Chrome yellow is a very attractive colour and strangely enough it mixes well with a whole range of other colours. 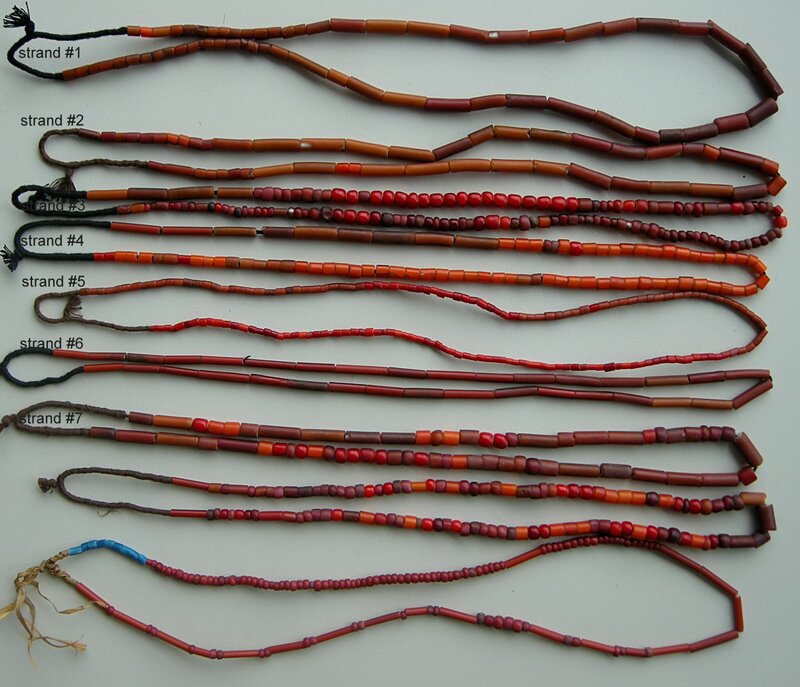 There are chips here and there on a few of the beads but in general these are in good condition. 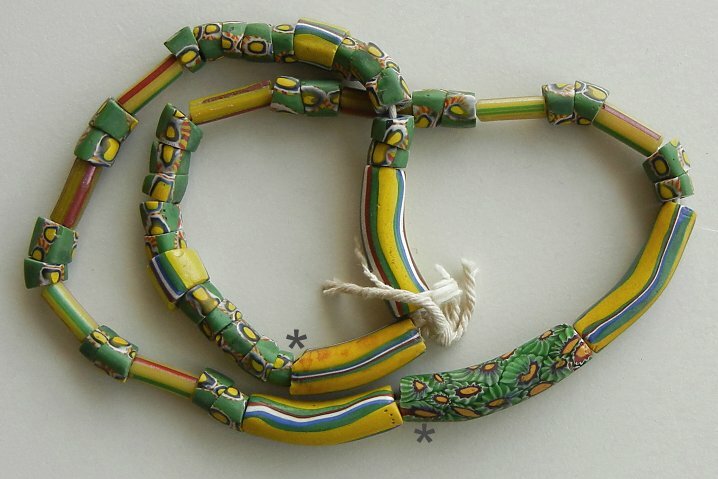 They date from the 1800s and there are some very curious beads tucked in. 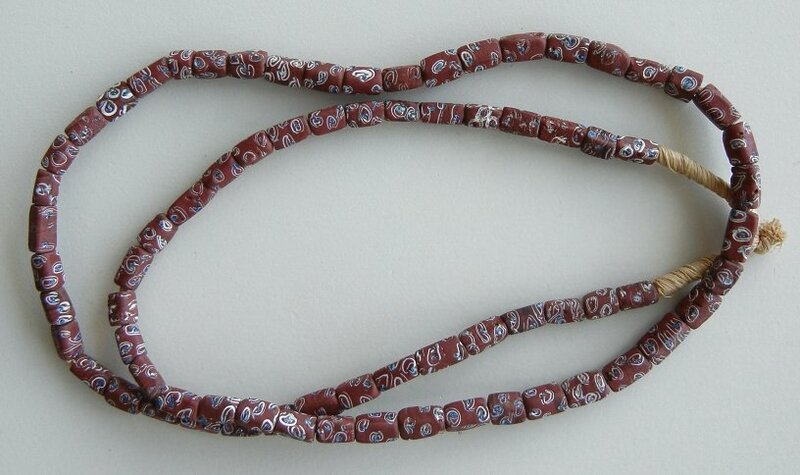 There are 6 oval beads with delicate and different squiggles on them. $185.US.